Kappabashi Shopping Street is only 10 minutes walk from Sensoji (Asakusa Temple). It is not sightseeing area but it must be very interesting spots for foreign travelers. This is the most famous street for the people who are working in the food business. The street last 800 meters and there are 170 shops who sell the variety of tools for restaurants. You can find from table wares, cooking tools, advertising displays, decorative ornaments and many kinds of equipments. These are ceramic table wares. The sign board shop itself is an interesing display like trompe l'oeil. But I think most interesting products for foreigners are food samples. There are crepe, spagetti, ramen (noodle), meat, fish, sushi etc which are all made of plastic. But they look like real food !!! 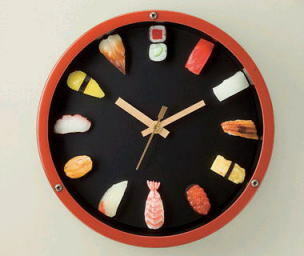 Sushi clock may be a good souvenir for laughing. Paper lantern which you will find at the entrance of Japanese restaurant or bar must be also interesting for you. Kappabashi Shopping Street has 90 years of history. Kappa means rain coat. But it also means an imaginary being. They enshrine Golden Kappa as a symbol of prosperous business. From the south-end of Kappabashi Shopping Street, there starts also an interesting street. There are many shops of Buddhist alters. You can also find Shinto shrine gate in one of these shops. If you have plenty of time at Asakusa, I recommend you to visit these streets with interesting shops.